View from the river of the town of Abington (previously Abingdon) in Berkshire, which was formerly the county town and was famed for its medieval abbey. The bridge and causeway leading to Culham were built in the 15th century by the Fraternity of the Holy Cross, opponents of the abbey, who worked on many local projects to encourage trade and help the poor. The social diarist and Viscount Torrington, John Byng, arrived at Abingdon in 1792 by boat, writing: "The view of Abingdon gave me pleasure ... The entrance and canal reminded me of Holland. We passed by the old wall - and under the gateway of the old Abbey - wherein the county prisoners are now confined." He left the town via the Culham Bridge. 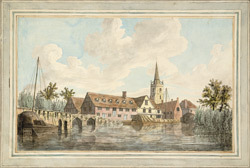 Abingdon abbey was demolished in the 18th century.